The Poverello Center’s mission is to fulfill basic needs: to feed the hungry and to give the homeless a bed, albeit a temporary bed. To help foster stability and reintegration into the community, partnerships with local social services providers allow access to healthcare, education, and counseling services. 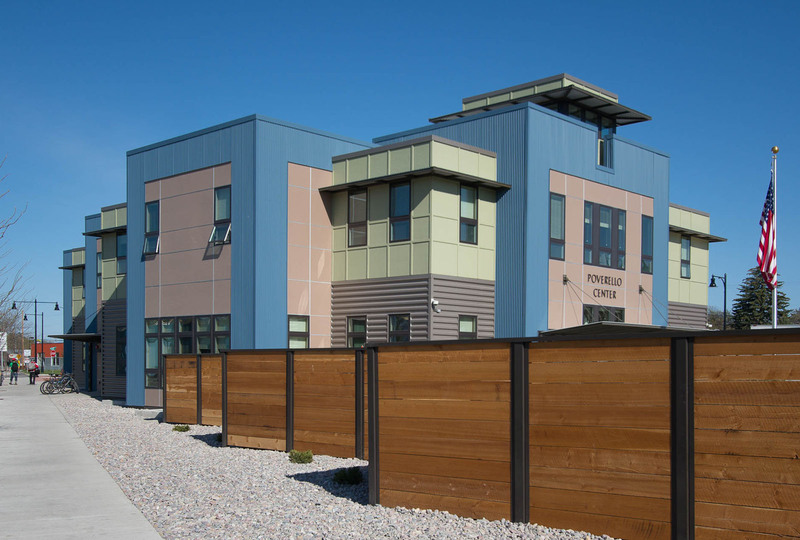 In 2010, the Poverello Center served 2,664 homeless individuals, including 20,330 nights of shelter to men, 4,776 nights of shelter to women, and 6,546 nights of shelter to veterans. In addition, 126,571 meals were served through the Food Insecurity Program’s soup kitchen. Designed to compliment the character of the neighborhood, the building features volumes that step in height along the Broadway street frontage. Awnings near roof elevation provide shade to second floor windows while awnings adjacent to entries help reinforce the pedestrian scale and provide shelter during building entry. A landscaped courtyard area for client use is enclosed for privacy and to mitigate impact on surrounding neighbors.